What is root canal treatment? What actually happens during root canal treatment? Why is root canal treatment performed? Is root canal treatment painful? Root canal treatment is a dental procedure carried out to treat the root canals of a tooth that have become infected, or when the pulp inside the tooth has become irreversibly inflamed. Why is root canal treatment performed? The most common reason for the canals in a tooth to become infected is from dental decay (dental caries). The dental decay spreads through the crown of the tooth and then eventually enters into the pulp chamber. Once the pulp chamber has become affected, the nerve and blood supply in the tooth soon collapse and the bacteria from the dental decay continue to spread to inhabit the root canals of the tooth. Radiograph demonstrating a large lesion located at the apex of the upper left central incisor. What happens as a consequence of the root canals becoming infected? The bacteria and their byproducts create an inflammatory response in the bone at the apex of the tooth. The response can either be acute or chronic. When acute, pain, swelling and pus discharge are common symptoms associated with the tooth. This kind of reaction is known as a dental abscess. However, much more commonly, the inflammatory reaction in the bone under the tooth is chronic, and in these instances the tooth is pain-free. The bone’s chronic inflammatory response is often detected only after the dentist has taken an x-ray (radiograph) of the tooth. 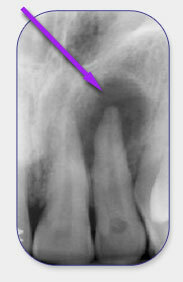 The radiographic image reveals a dark spot at the apex of the tooth (Figure 1). 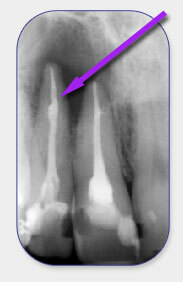 This dark spot represents loss of bone around the apex of the tooth, which is part of the bones inflammatory response to the bacteria in the root canals. Leaving an infected tooth in the mouth increases the risk of an acute abscess forming which can be very painful and harmful to the patient’s health. Ideally an infected tooth should either be extracted or root canal treated to remove the source of infection. The aim for root canal treatment is to remove the infection from within side the root canals, so that the tooth can ultimately be saved. By saving the tooth the patient is avoiding having a gap, denture, bridge or implant. What actually happens during root canal treatment? The dental procedure, called root canal treatment, or endodontic treatment, aims at opening and preparing the root canals of the tooth, disinfecting the root canals to kill the bacteria residing in the canals, and then finally sealing the canals with a root filling material. The tooth is then restored with a permanent filling. Assessment of restorability A tooth must be restorable to make treating the root canals worthwhile. If after the root canal treatment has been performed there is insufficient tooth tissue left to properly restore the tooth, it makes performing the root canal treatment pointless. Hence, the first aim of any endodontist is to assess whether or not the tooth is restorable, and this assessment is carried out at the consultation stage. Factors that may affect the restorability of a tooth include the size of the cavity in the tooth, the amount of bone supporting the tooth (periodontal status) and whether there are any cracks present in the tooth. Cracks sometimes are only discovered following commencement of treatment. If they are discovered and are found to adversely affect the restorability of the tooth, the endodontist will then cease treatment and temporise the tooth at this point. Crucially, when performing any root canal treatments, a rubber dam must be used. This has two main functions. The rubber dam isolates the tooth preventing contamination of the root canals with microorganisms in saliva; and secondly the rubber dam acts as a safety barrier to the rest of the mouth. The root canals are accessed and prepared using specialised endodontic instruments called files. The endodontics files used are either hand held, or are driven in a circular motion by a special endodontic hand piece. The purpose of preparing the root canals is to remove the bulk of the infected tissue from the root canals, and to allow the disinfectant to access the full length of the root canals. Microorganisms residing in the root canals drive the inflammatory response that creates the pain and swelling associated with dental abscesses. During the preparation stage, the root canals are continuously irrigated with a disinfectant. This is used to kill the microorganisms (bacteria) residing within the canals. To prevent the regrowth of microorganisms, the root canals are filled with a root filling material. Gutta Percha is the most commonly used root filling material and it is cemented into the root canals following canal preparation and irrigation. Radiograph demonstrating root filling and coronal restoration in upper left lateral incisor. 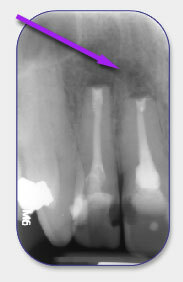 Following filling of the root canals the coronal part of the tooth is restored with a filling and this is usually a white composite filling material. 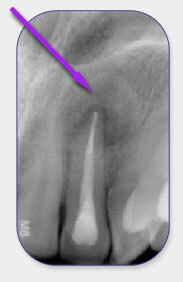 If there is insufficient coronal tooth tissue to support the filling, a post may need to first be cemented within side one of the root canals. The post helps retention of the filling. Following root canal treatment teeth are structurally weaker. The filling in the tooth is inevitably large and furthermore, the tooth becomes dehydrated with time, as the blood supply within the tooth has been removed. For this reason it is often advised that, following root canal treatment, molars and premolars (teeth at the back of the mouth) are restored with crowns, which gives them improved structural integrity. Patients will always be discharged back to their referring dentist for the provision of any crowns that are needed. The actual root canal treatment itself is relatively pain-free. This is because, in most instances, the nerve inside the tooth is dead. Following root canal treatment and for a few days after, the tooth can have a little ache and the associated area can feel slightly uncomfortable. In most cases painkillers help greatly to minimise the discomfort felt following treatment. All patients that have had root canal treatment are encouraged to return one year later to follow-up the outcome of the treatment. At this appointment the tooth is radiographed/x-rayed to ensure that any lesions that had been present has now healed (Figure 3b). 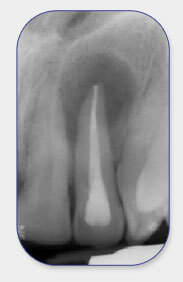 12-month follow-up radiograph demonstrating complete healing at the apex of the tooth 12 months after completion of the root treatment. Anatomically, the inside of the tooth can be very complex. Endodontic microscopes make treatment of root canals much easier by improving significantly the illumination and vision of the inside of the tooth. The pre-operative status, determination of the length of the canals, post-operative status and assessment of outcome relies on the use of radiographic imaging (x-rays). At Harpenden Dental Centre we use the latest digital radiographs, which provides superior image quality and are safer for the patient compared to the old film based radiographs (x-rays). The preparation of the root canals needs to be exactly to the apex of each root. The apex loactor is used to ascertain how long each root canal is, so that the root canal preparation can be carried out exactly to the apex of the canal, as too short or long a preparation may adversely affect the outcome of the root canal treatment. This is used for taking photographs of the inside of the tooth. This is helpful for communication of treatment to both the patient and referring dentist. Similar to the intra-oral camera, this is a very useful tool for communicating complex root canal treatments to both the patient and referring dentist. The success of any treatment cannot be guaranteed and root canal treatment is no exception to this rule. Root canal treatments carried out initially have a 90-95% chance of success. If a root canal treatment is being done for a second time on a tooth (because the initial root treatment has been unsuccessful), the chance of success is about 80-85%. These figures are consistent provided the tooth is restorable.